This mid back mesh chair is comfortable, functional and budget friendly. 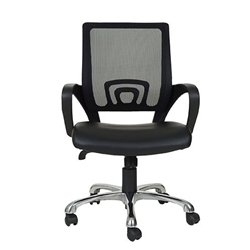 Its swivel tilt control, adjustable tension and height control allow you to establish your own unique comfort level. The lumbar waterfall seat, aluminum polished base, black arms, seat and mesh back contribute to the Phantom's sleek and modern design.